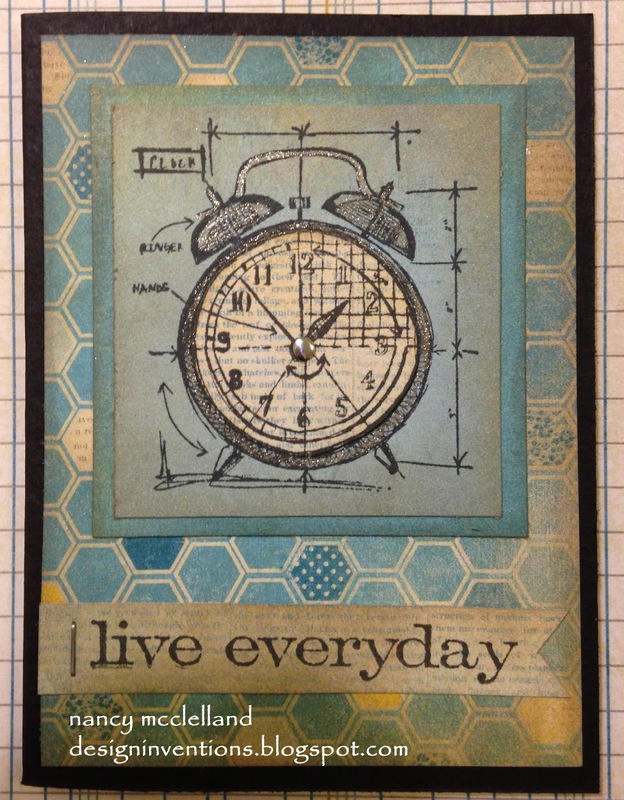 I used one of our monthly inspirations to jump start my design and with a few variations, here's my finished card. This was an easy card and fun to put together. If you haven't had a chance to experience Amuse Studio, you should go over to my site and look around. 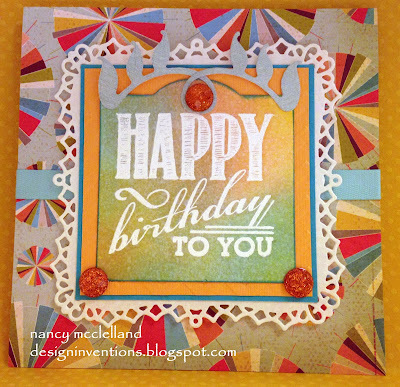 The cardstock is great for cards because it's white on one side and color on the other. Super colors to pick from and oh, so many of stamp sets. 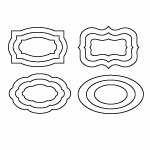 We also introduced digital cut files this month that coordinate with stamp sets,so check those out. I received a box the other day from my sister and she had included a couple of extra items. I now have 2 new Thinlits dies that make fold out cards. Before I put them away I decided to make a card for my special Sister. It was very easy and it has many little extra dies included. I hope you like it, JO and it will arrive in your mailbox soon. I thank my sister once again for the present and hope you enjoy the card. 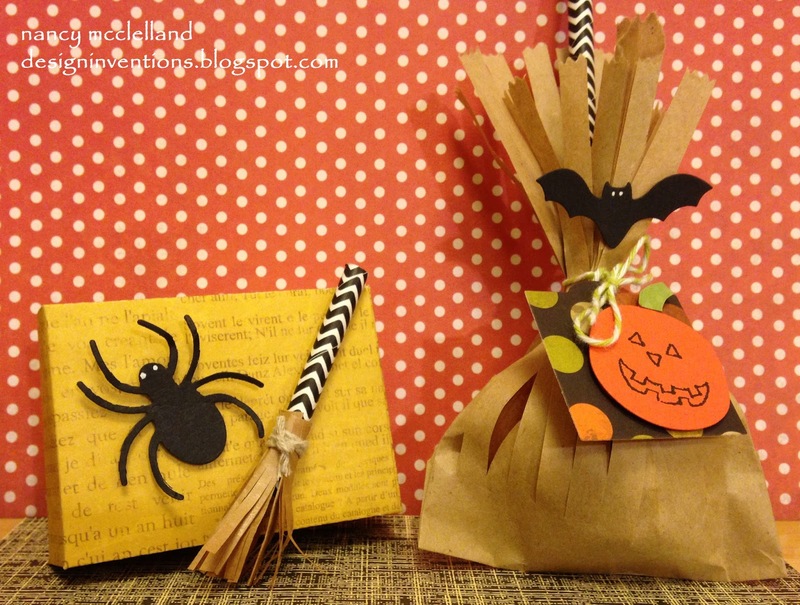 I wanted to share a couple of treat ideas with you. These have been inspired by the Amuse Studio Catalog and their facebook page. Having most of the supplies, I made a small candy/treat box and then the fun broom sack for treats or a sucker. The printed straws are everywhere today and they come in all colors. The spider, bat and pumpkin are die accents pieces from the Candy Box set. The box is the base of that set. Just add accents to decorate. For the broom sack, I first cut slits down the sack and stopped about 1 inch from the bottom. I put the straw over the sucker stick and placed in the bag. Using some twine I tied the bag around the straw, then added accents. 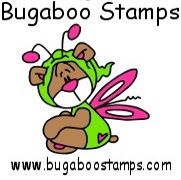 I am extremely fond of the 6 X 6 background stamps from Impression Obsession. I recently picked up a new addition to my inventory and today I am featuring a CAS card using the background. 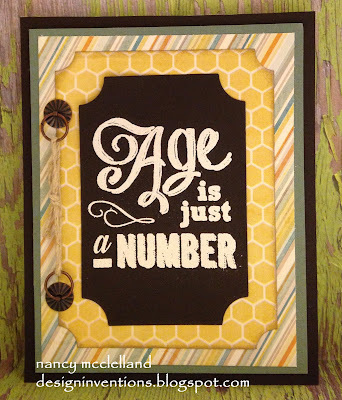 I used Ranger Distress inks and stamped the image multiple times using different colors. 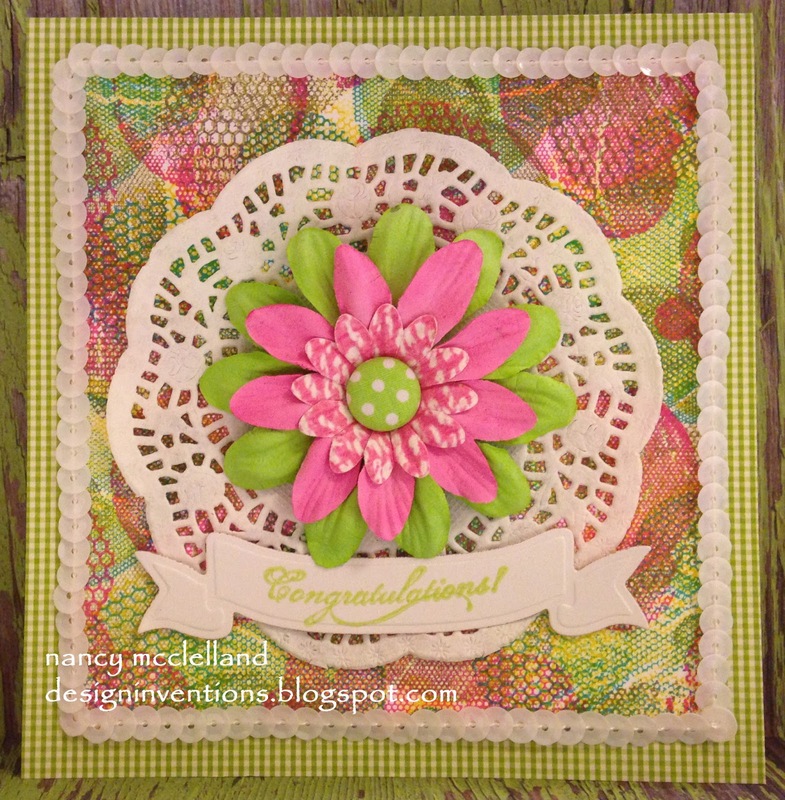 I love the effect and decided to make a Clean And Simple card by just adhering flowers over a doily. 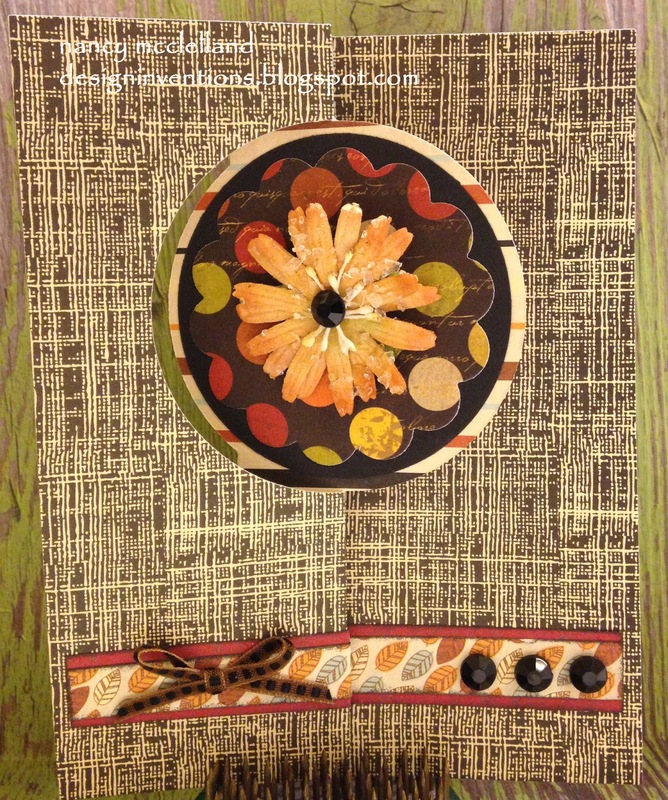 The sequin border is sewn in a row, so very easy to attach with line tape. Simple sentiment on a banner, finished! My final card featuring the Stampendous fruit stamps will be "Orange Blossom"
I must admit this is probably my favorite because of the orange, but it was just overall fun. I have been using a little dot method of shading on these three card which has worked very nice. I enjoy this type of coloring with my Copics, but you have to have the correct type of image to make it effective. These fell right in that category. Thanks for stopping by and I appreciate all comments on how you like these cards. Today I want to feature the second of my cards from the collections of fruit stamps. 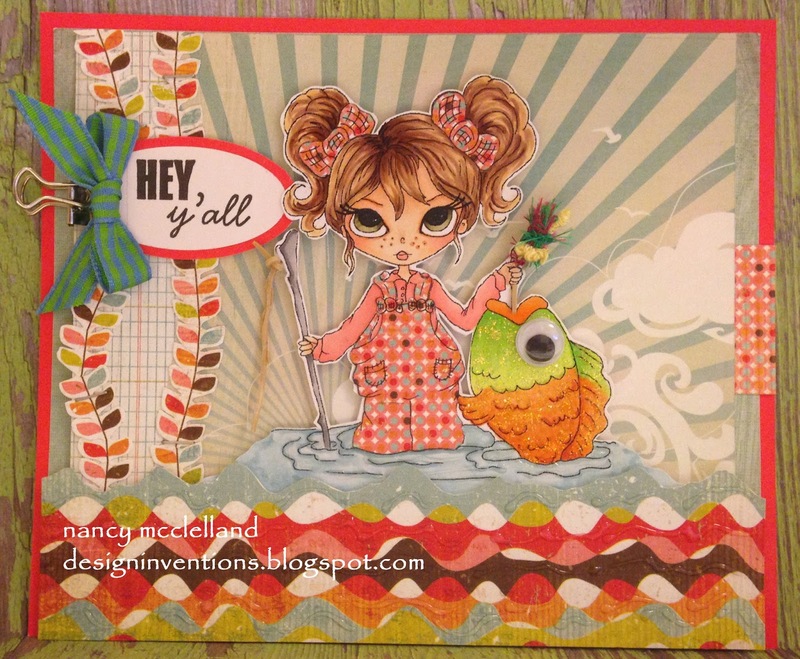 This image was simpler than the other two so I used a frilly Spellbinder die as the background. I added a few pearls on the little flowers and a black checked bow. Thanks for stopping by and be sure to check back for my final card. It's Monday and time for a new challenge over at The Outlawz. I must admit that I was really looking forward to this week as our challenge was something to do with Dogs!!!! Yippie. I enlarged the digi so that he was almost full card size and the BIG focal point.I hand cut the large bone in back and then fussy cut the smaller brown bone. I added ribbon, brads, a paperclip and quite a few rub-ons. Oh, I can't forget those googly eyes. 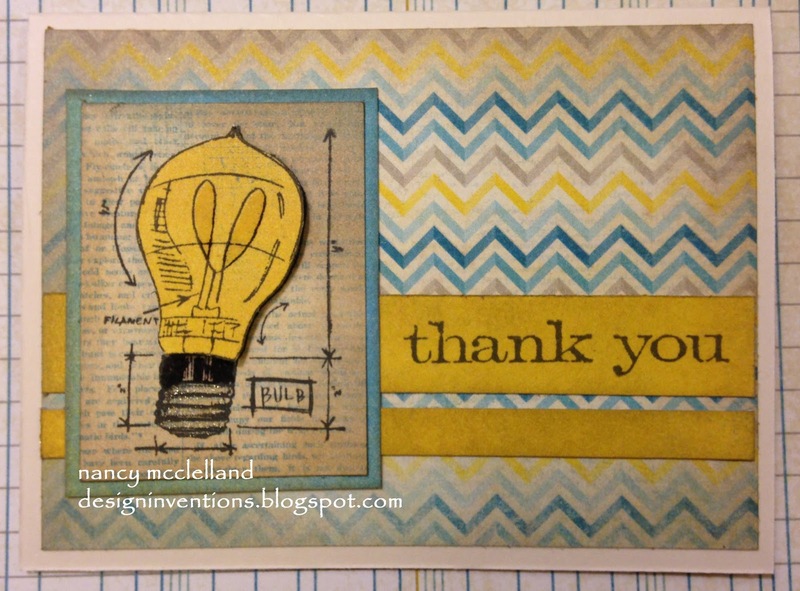 I had a great time with this card and thanks for stopping by to visit. Don't forget to hop over to The Outlawz and play along this week. 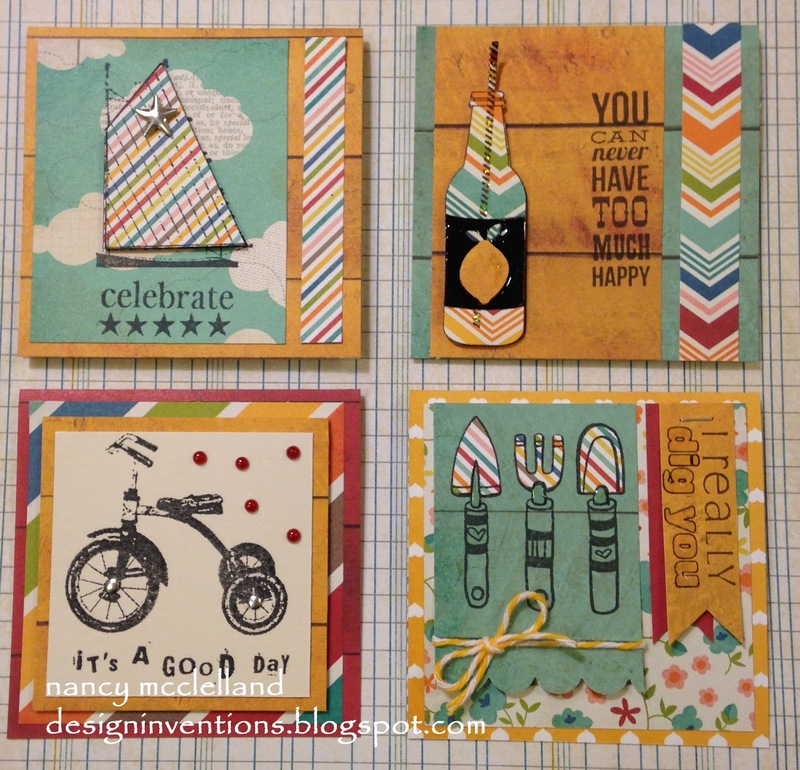 This week at 613 Avenue Create the DT's had an anything goes challenge. I used an image from The Paper Shelter (How Ya Doin'). I thought this was such cute image, so I colored it up and started the process of putting it together. 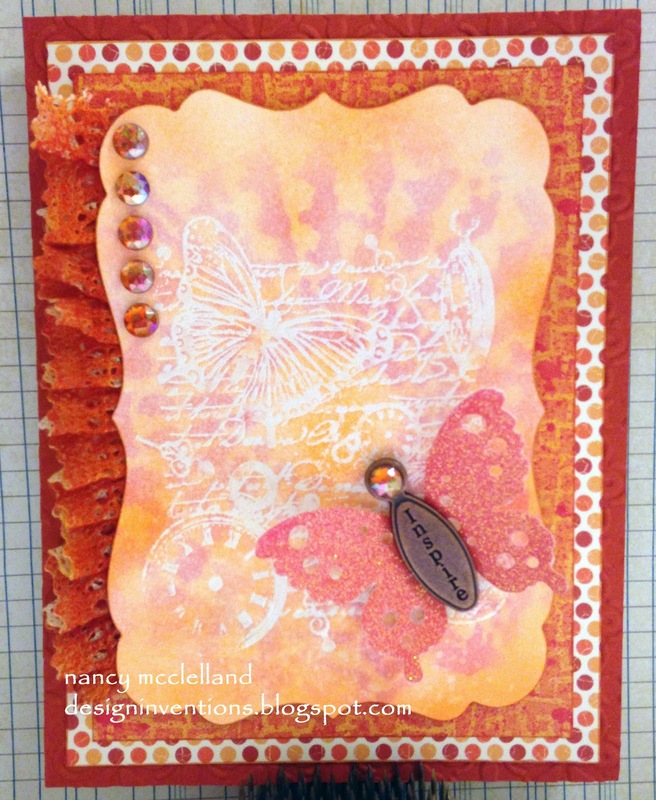 I chose a front step card as my base and then added several papers. We did have a few requirements for the project and I have included the graph below. You must include at least one thing from each column, but can use up to 3.
glossy accents, bling, ribbon, faux stitching. Thanks for stopping by today and I hope you hop on over to 613 Avenue Create and join in the fun. 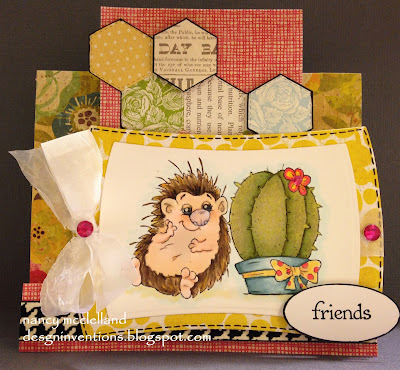 I finally got to spend a little time in my craft room and wanted to play with a few of my new stamps. This is the first of several I picked up with a fruit theme. 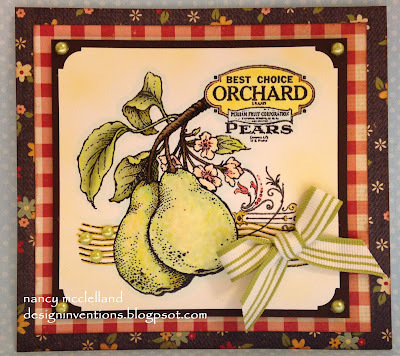 This first one is of pears and is such a pretty and easy/simple stamp. Fun and quick. Now off to color some more, thanks for stopping by. So I had a chance to play a little in my craft room tonight. After I got back from my little vacation my schedule was packed for almost two weeks. Things will hopefully be back to normal next week. I did a little cleaning and put together one of my "use what's in front of you" cards. 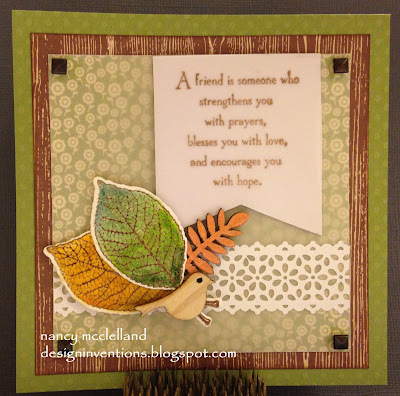 I was playing with a new stamp set and some Tombow markers, so I have a couple of fall leaves, then I had a couple of wood pieces laying around that I didn't use on my last DT project. There's a piece of paper lace tape that my sister sent me, along with some vellum. I used the vellum as an overlay (that's why you see the haze in the middle), and last the sentiment was stamped on the vellum but I had to back it with white so you could read it. Thanks for continuing to stop and visit. This week over at The Outlawz Greeting Challenge we are featuring projects with One Color. Pick shades and tones from one color family and make a card. I colored the lace with Copics and did a resist technique on the center focal image. I hope you stop over and get some fabulous inspiration from the other DT's. 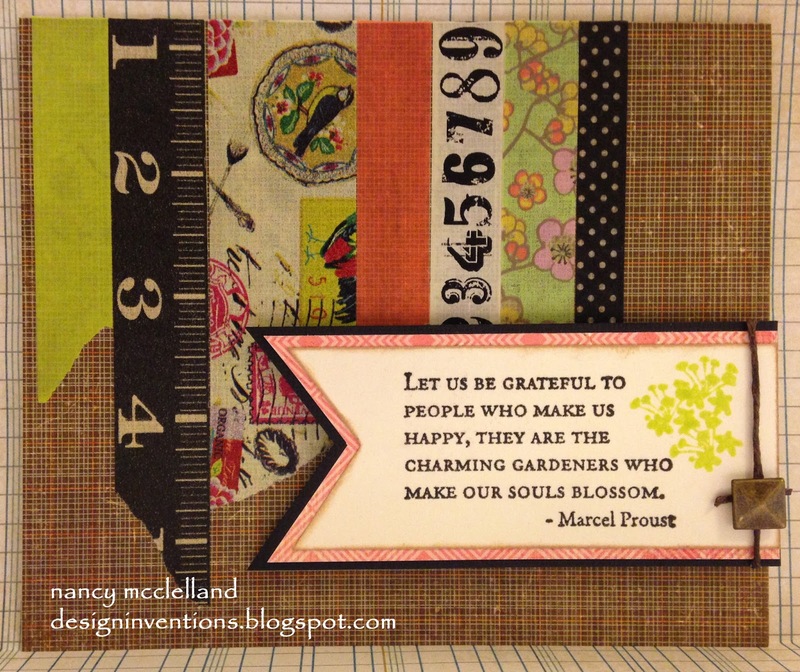 I want to share the card for my DT challenge post this week at 613 Avenue Create. We want you to make a card using a school supply. 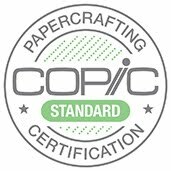 Everyone has a paper clip, staple, rubber band etc in your craft room. Pull some of that stuff out and get it on a card. 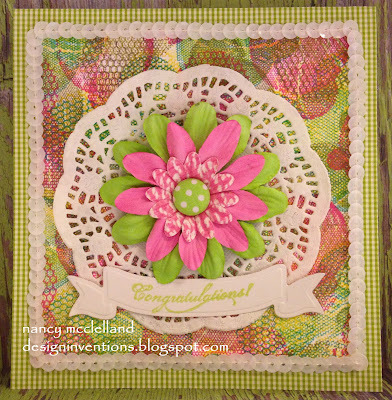 Here is my card, using an image from Lacy Sunshine, the sponsor for this week. I used a rubber band as line on the fishing pole, a few staples on the vines and the binder clip holding the sentiment. Thanks for stopping by today, and I hope you decide to join us this week. I just wanted to say Hello this morning. 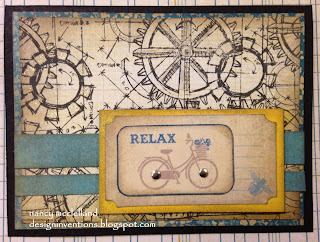 I'm on a mini retreat at Stamp Away in Cincinnati , Ohio. May have some pictures a little later to post after my classes. Thanks for stopping on today. 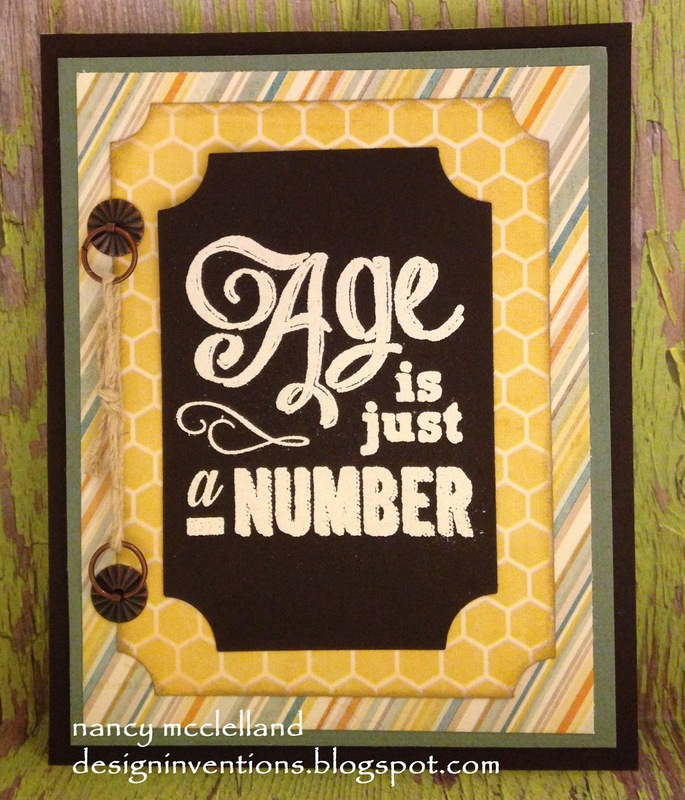 Today I want to share a Birthday card that I made for my sister. Her Birthday was yesterday, the 6th, but I was actually traveling to her house and couldn't post the card until I gave it to her. The stamped image is another selection from Amuse Studio, Eat Cake Collection. 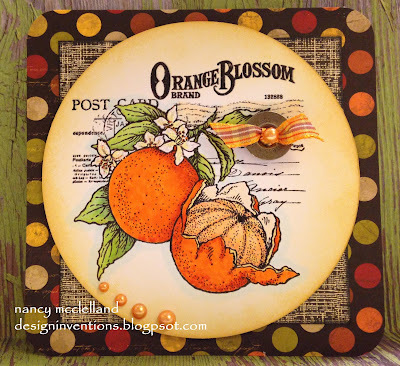 I did a resist technique by stamping embossed white on white paper and used Tim Holtz Distress inks to add color. 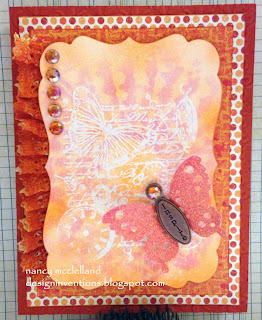 Layering several papers and using a Spellbinders Die to add the frilly edge. A little bling and ribbon. There may be a little surprise inside???? Happy Birthday Jo! Love you. I want to share a really super quick card idea that literally took me 7 minutes. 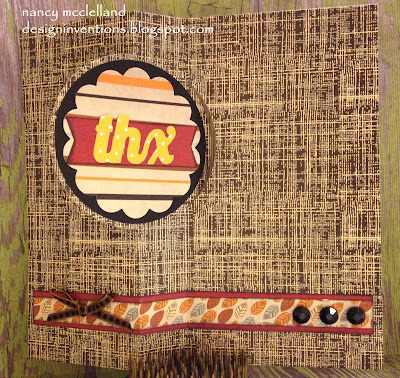 I covered a card front with some patterned paper then placed strips of washi tape on the front left corner. 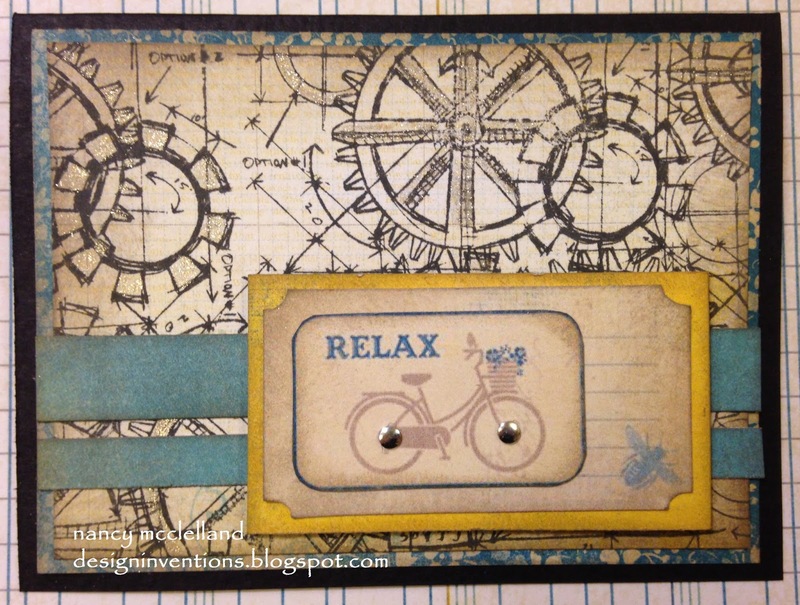 I then stamped a sentiment and layered on additional cardstock. A little ribbon and a metal stud. 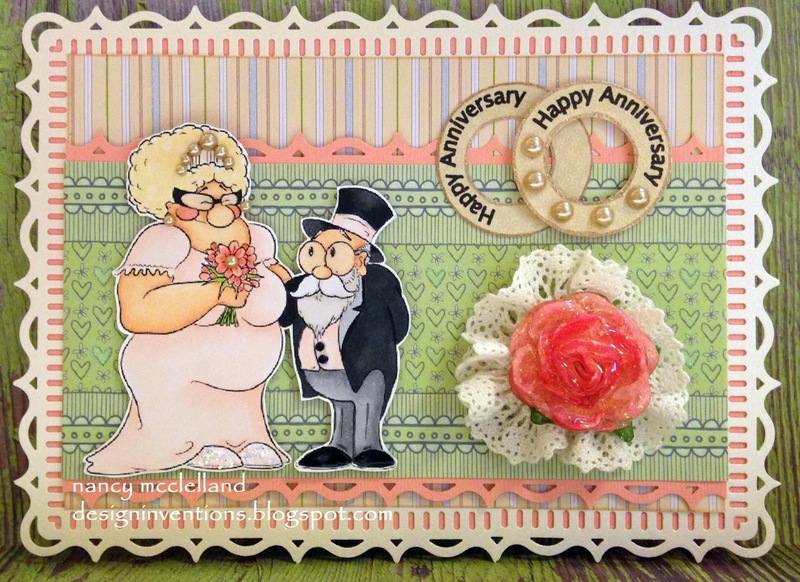 It's a New Greetings Challenge at The Outlawz and I would Love to share my DT entry. and this is 'Morris and Mildred'. This weeks challenge is to make a card for a 'Happy Anniversary" and you must use pearls, rings, ribbon in your design. Also don't forget the Sentiment. There are days that this is so true and then sometimes I really feel my age. This featured stamp is from Amuse Studio - Eat Cake set. I love the chalk board lettering, which is all the rage right now. 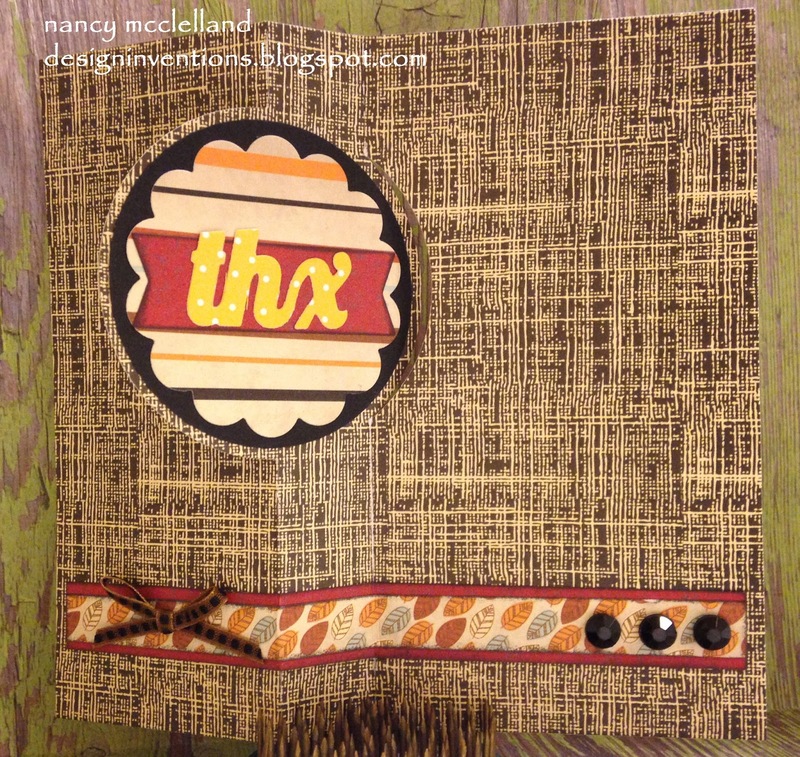 I stamped white on dark brown and layered on several patterned papers. Adding a couple of fun brads and twine as an accents. Well today is the final day of my Mini Card Series. I purchased the kits from Archivers and I believe they are a GREAT value. 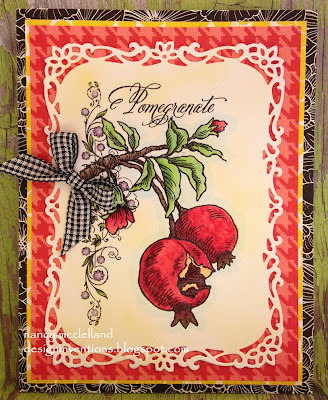 You get so much in the kit, enough to make multiple cards, usually embellishments or stickles type of thing, a set of stamps and a 6 X 6 paper pad. 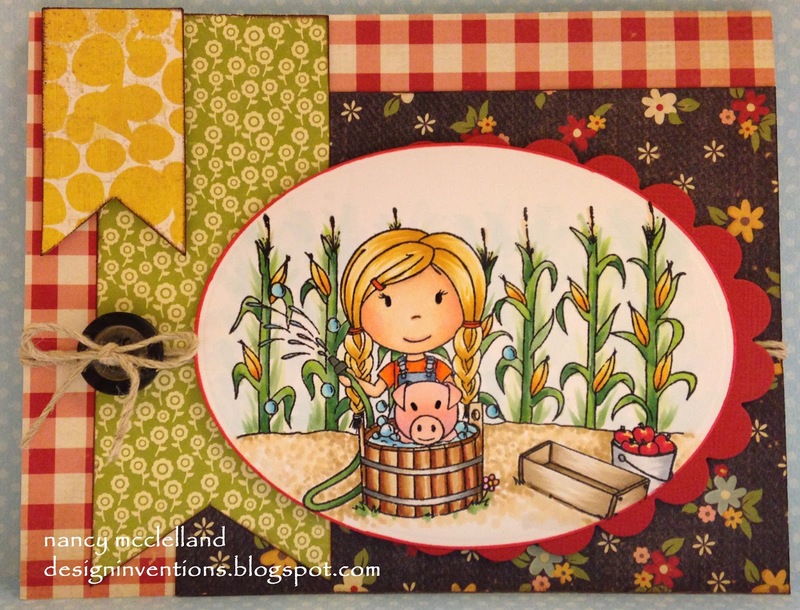 You have so much left over to use for more cards or other projects, plus you always have the stamp set. This set has something for all occasions and the sentiments alone are fantastic. Once again these are great thank-you cards, package tags, or special invites. I hope you have enjoyed this series, and if so leave me a comment. 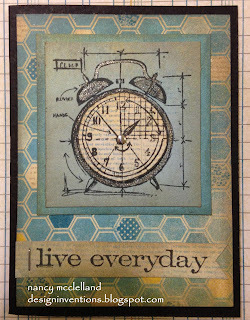 Day three of the Mini Card series features some of those fabulous Tim Holtz blueprint stamps. These are the mini version of the image, I'm not sure if they come in the larger size. I like the smaller image for card making because it is just more versatile. These are the three mini cards I made from the Archivers package. It came with card stock, 6 X 6 paper pad from Authentique(Seasons:Summer), 3 image stamps and 2 sentiment stamps and a Stardust Pen. There is also enough paper in the pack to make matching envelopes for the card. I hope you enjoy this collections and stop back tomorrow for the final collections. Sorry I'm so late with my post for the day, but I was babysitting and really wasn't thinking when I put the baby down for his nap. 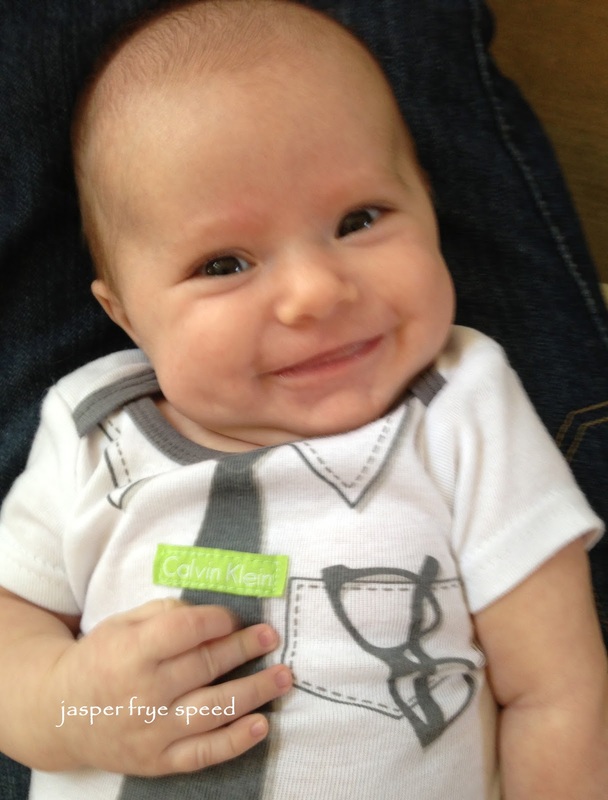 We weren't close to the craft room, so no crafting today. As I promised though, I have another addition of mini cards to share. 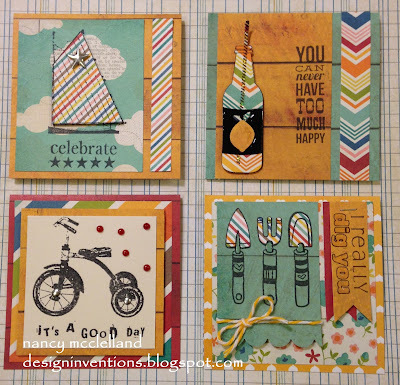 This is the Sassy Style set from Archiver's that includes a stamp set from Unity, 6 X 6 paper pad from Carta Bella (Cool Summer), card stock and glossy accents. These are all 3 X 3 cards and I just think they are so clever. 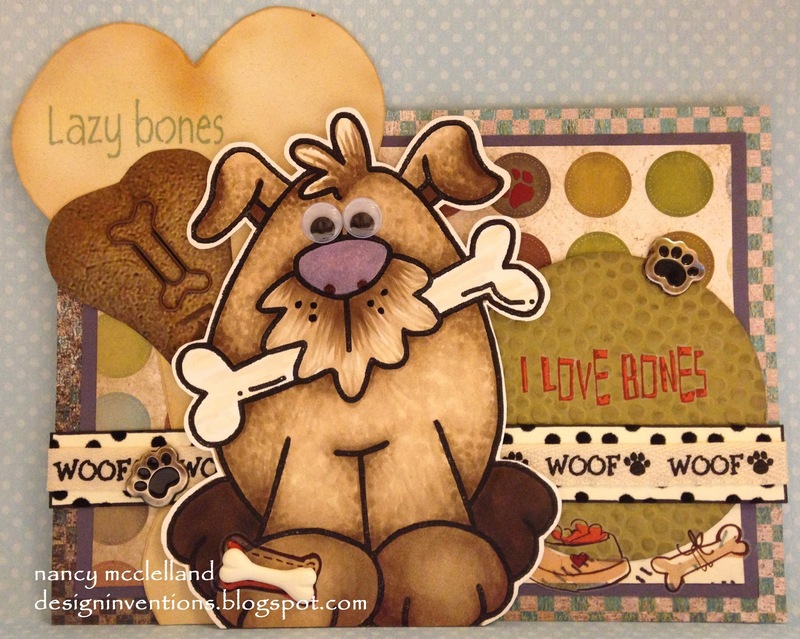 There is alot of fussy cutting and tedious gluing, but well worth the time and effort.